Original rap metal band Body Count combines the immense collective talents of Ice T, Little Ice, Ill Will, Ernie C, Sean E Sean, Vincent Price and Sean of The Dead. Having released their latest album Bloodlust last year, they now head to the UK to play a major London show at KOKO on Tuesday 12th of June 2018. You know just how exciting this is, and with the demand growing as more people find out you will have to act fast and ensure you book your Body Count tickets before they all are taken. Placing an order for your essential gig ticket is made easy with Gigantic as you can access the site 24/7 with a smartphone, tablet or on your computer. But, leading busy lives it is easy to forget that these tickets will become available at 10:00 on Friday 13th of April. So, set a personal reminder with Gigantic so we can alert you with an email or text message just before they are released. Their often controversial fusion of thrash and hip hop was first captured on an eponymously titled debut album in 1992. Subsequent album titles include Born Dead, Violent Demine: The Last Days, Murder 4 Hire. Manslaughter plus their latest offering; Bloodlust. “Murderous fantasy-fulfillment, it may be. But nobody does it better.” - Kerrang! 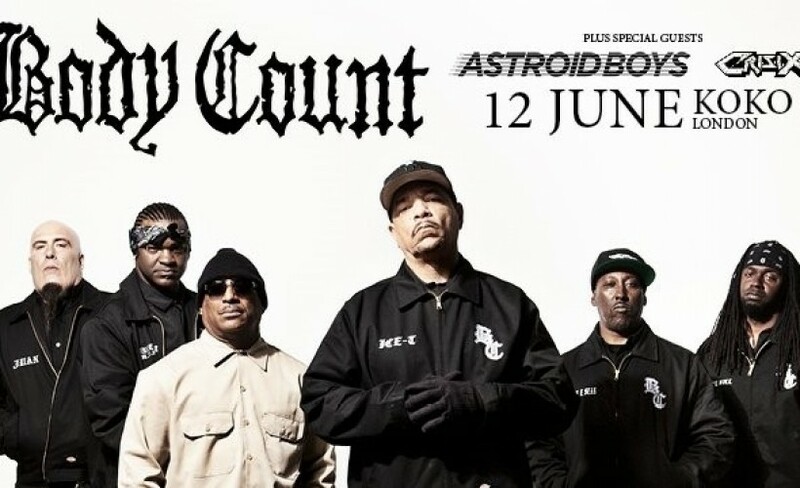 It goes without saying, there are only limited supplies of Body Count concert tickets being made available so please do not hang around and book yours early to avoid being disappointed. Offering expert customer services on a wide selection of essential gig tickets, Gigantic is the award-winning ticket vendor which is your first step towards enjoying your big night out.